Members of Bascombe house wore their bright yellow shirts proudly last Thursday as their house was awarded first place in the Sion Hill Government School Sports. The students, decked out in their blue (Nicholas), red (Mckie), yellow (Bascombe) and green (Mulraine) house shirts, gathered at the Sion Hill playing field pavilion for the prize giving ceremony, which followed the events. Cheering for their houses, the children were truly excited as they waited to see which house would emerge victorious. The students were, however, reminded that not winning does not necessarily make them a failure. The houses were then rewarded for their excellence during their sports meet. Individual medals were awarded to students who gained the top three places in the various races. 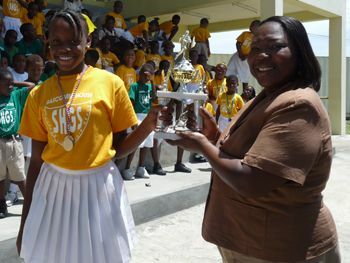 Trophies were also awarded to students who qualified as champions in the under seven, under nine, under eleven and under thirteen categories. The Victor Ludorum award went to Nathaniel Carrington of Bascombe House, while the Victrix Ludorum title went to Mashada Charles, also of Bascombe house. Overall winners were Bascombe house. Mckie House came in second, followed by Nicholas house and Mulraine house in third and fourth place, respectively.